In today’s video I pulled out my new Christmas Dreams set – with a sleeping kitty and puppy, did you ever think I’d skip buying this set? Heck no! I used a lot of the images in the set (but not all) and in the video I show you some tips for figuring out where a fireplace casts light. Watch the video below or click HERE to see it in HD on YouTube. 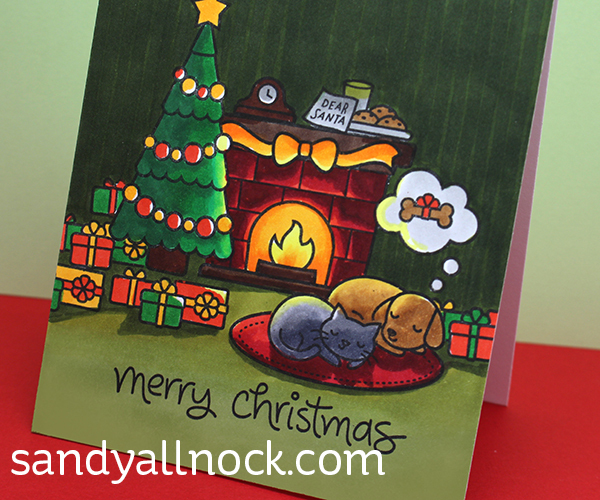 A sweet card…and perfectly flat! This is such an amazing card again ! Thanks for the helpful tips. Stunning and oh what a beautiful card to have! You never cease to amaze me with your talent! Beautiful!! I ordered this stamp set because of your video. 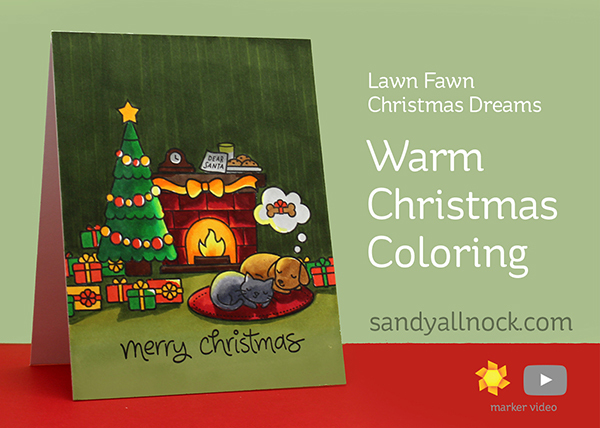 I paint loose watercolors but your blog and videos make me want to do coloring to make cards because I would like a neater and crisper looking way to send a quick gift to a friend – thank you for your encouragement and you are SO TALENTED!!! I love your Bible journaling too….I would love it if you would do that in more of an Art journal style rather than just in the Bible itself – not that I’m opposed to that or anything just sharing something I haven’t seen anyone do. I’m trying to create an art journal of the book of Ruth!! Blessings to you! I must tell you that I just Love your videos! This card is just amazing , as all your cards are. Thanks so much for the tutorials and inspiration!! You Rock! It was a joy (again) to see and here you colouring this beautiful card. Thank you and have a nice weekend. It’s a 1 layer card… wondering if there was bleed thru on the back. Of course, yes, that’s how Copics blend. I adhered the colored piece to a card base. I have made several cards with this set. I am up to 43 Christmas cards done..7 to go. I knew I needed this set as soon as it was previewed and my LSS ordered it for me so I got it almost as soon as it was released. That is amazing! Is there any way you could color it once and then have it professionally printed? I’ve thought how much time goes into 1 card. Pretty sure I need this set now. Thanks Sandy!! !